WASHINGTON, D.C. -- Americans' support for the Tea Party has dropped to its lowest level since the movement emerged on the national political scene prior to the 2010 midterm elections. Seventeen percent of Americans now consider themselves Tea Party supporters, and a record 54% say they are neither supporters nor opponents. The Tea Party emerged in 2009 in opposition to the fledgling Obama administration, and many Americans took sides for or against the movement in the midterm elections the next year. Support peaked at 32% in November 2010, just after those elections, in which Tea Party supporters were widely credited with helping the Republican Party gain control of the U.S. House of Representatives. As support gradually eroded over the next year, opponents of the Tea Party gained the upper hand and have led supporters in all 10 Gallup polls measuring views of the movement since the start of 2012. Since August 2012, support has failed to reach 25%, and it has fallen below 20% in each of the last two polls. Meanwhile, opposition peaked at 31% just ahead of last year's midterm elections, but has dropped to 24% in the most recent Gallup poll, conducted Oct. 7-11. Support for and opposition to the Tea Party movement have been consistently divided along ideological and political lines over the last five years, with Republicans and conservatives the biggest supporters, and Democrats and liberals the strongest opponents. A comparison of the combined results of the first two Gallup polls measuring Tea Party support, in March and May 2010, and the two most recent polls, from this month and November of last year, reveals where support and opposition are strongest and where the most significant changes have taken place. On the other side, liberal Democrats were the strongest opponents (61%) in the two 2010 polls, and their opposition was almost as high (59%) in the two most recent polls. A few groups that were more likely to be supporters than opponents in 2010 have since switched sides, including those 65 and older, and those who are married. 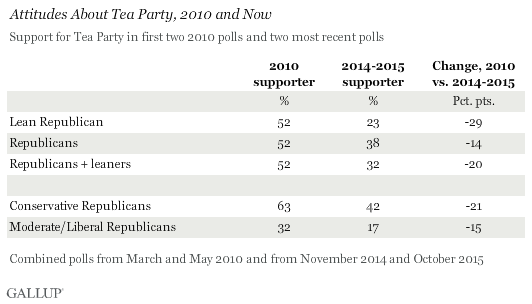 While support for the Tea Party has not increased among any major subgroup since 2010, opposition to it has gone up among one -- those with postgraduate education. In the earlier polls, 36% of this group opposed the Tea Party, and that number has grown to 53%. Meanwhile, opposition has dropped in a few groups -- 18- to 29-year-olds, those with low incomes and unmarried females -- because more in these groups no longer have an opinion about the Tea Party. Republicans made huge strides in the 2014 midterm elections, including increasing their majority in the House and gaining control of the Senate. However, the Tea Party movement that had played such a huge part in the GOP's 2010 election successes was much less visible this time around. Still, several Republicans elected to the House and Senate with Tea Party support have become major players on the national stage, including presidential candidates Marco Rubio and Ted Cruz. The Tea Party movement has also been tied to the Freedom Caucus, a group of conservative Republican members of the House who have played a key role in the current battle to select a new speaker. While the effects of the Tea Party movement on previous elections still resonate, the big drop in support from Republicans and Republican leaners over the past four or five years may indicate that the Tea Party movement's impact on American politics is fading. 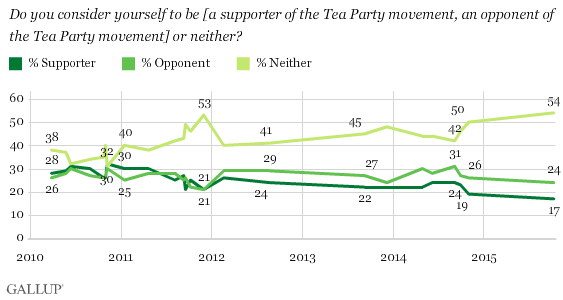 The drop in support for the Tea Party from Republicans and conservatives did not come about because they became opponents of the movement. Rather, the rise occurred in the percentage saying they neither opposed nor supported the movement. The previous low in the percentage of Americans who either supported or opposed the Tea Party came in late 2011, a few months before the first primaries of the 2012 presidential campaign. By February 2012, after the first primaries had taken place, the number who supported or opposed had grown by 13 points. If more Americans begin taking sides on the Tea Party over the next several months as the political campaigns heat up, there's more room for a return to support among Republicans than for an increase in opposition among Democrats. Historical data for this question are available in Gallup Analytics. Results for this Gallup poll are based on telephone interviews conducted Oct. 7-11, 2015, with a random sample of 1,015 national adults, aged 18 and older, living in all 50 U.S. states and the District of Columbia. For results based on the total sample of national adults, the margin of sampling error is ±4 percentage points at the 95% confidence level. In addition, two sets of Gallup's polls -- two from 2010 and two from last year and this year -- were aggregated to create combined results from the first polls and the most recent polls testing attitudes about the Tea Party.